Jerry’s Search ‘n Sketch, the Ultimate Scavenger Quest – 2017! 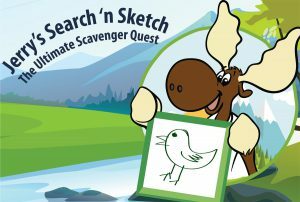 This past summer BC Parks, in partnership with Camping RV BC Coalition and Fresh Water Fishery Society, launched a fun, new park activity for kids and families called Jerry’s Search and Sketch, the Ultimate Scavenger Quest! If you and your family had fun participating in Jerry’s Search and Sketch, the Ultimate Scavenger Quest, it is happening again this summer! This year we have added some fun, new, searchable items. Once the Scavenger Quest is complete you could win a collectible Canada 150 Jerry the Moose pin, stickers or tattoos! For a BONUS prize, you can win a weekend of free camping next season. How to enter? 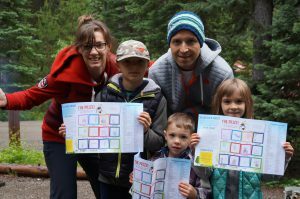 Take a photo of you (and your family) with the completed Scavenger Quest and either share the photo on BC Parks’ Facebook page or email it to marketingbcparks@gov.bc.ca. Families loved the Scavenger Quest because their children enjoyed searching the parks and drawing sketches of what they found. The kids also loved the collectable Jerry the Moose pin! 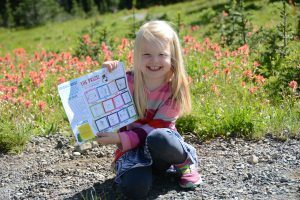 The program was also very popular with parks staff as families spent their time exploring the beauty BC Parks has to offer. 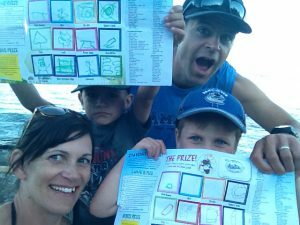 Families who shared their photos of the completed scavenger quest, either by Facebook or by email, were entered into a draw for a free weekend of camping in BC Parks and a winner was drawn at the end of November.